Be Known for Something : Discover Your Church Communication Thread / Business Essentials / 3000+ Days. Almost 3000 Deaths. A Big Change. We’d just moved to the United States from Canada. And had just decided that the future for our family was going to be in North Carolina. We were going to start a branding agency. I was raised in Canada. In my childhood, I celebrated victories of the past, and my family often talked about the freedoms we had. It was a theme that ran through my school years; but I never fully understood the price. Then, on a beautiful sunny morning, in front of my computer, I worked on a business plan and some design work. As I sat alone in my home office, the TV glowed in the background. Matt Lauer interrupted; “a plane has hit the World Trade Center tower”. I’d never been to Lower Manhattan, didn’t really know much about those towers, and never in my wildest imagination did I realize how much my life would change that day. As the day unfolded, I couldn’t work. I was spellbound as I watch the second plane. The towers fall. The pentagon. Flight 93 in Shanksville. My optimism was converted to uncertainty. So many lives were snuffed out in death. That day, I changed. I realized that I took freedom for granted. I never fully appreciated first responders. I never considered that a people group in the world; hated me for the freedoms I enjoyed. 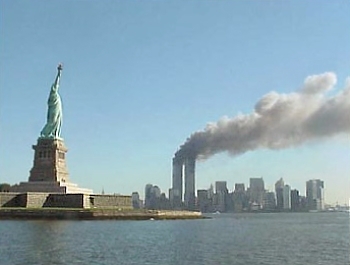 Today, as I reminisce about September 11, 2001, I realize that the 10 years has changed me. And like the years of business has too; it’s matured me, and allowed me to have a healthy skepticism in the people I meet. But most of all, I celebrate and value my freedoms. We need to thank God for them. While they last.